On January 21, 2009 Powertech reported they had collected soil samples in support of a land application process at their proposed Centennial Project. The results were incorporated into permit applications. A permit for land application would allow the irrigation of uranium-mining wastewaters onto the surrounding soil. Radionuclide - containing water, either from purge water from production well fields or from restoration wastewater from restoration well fields, is treated to unrestricted release levels and disposed of by irrigation. Release onto the soil surface will contaminate the soil at the land application areas. The radionuclides adsorbed by the soil will become a source term for radioactive release through wind (http://web.ead.anl.gov/mildos/documents/milltr98.pdf). It has been reported “all of the areas planned to be mined by Powertech are well within the present property boundaries and do not conflict with adjacent ownership” (http://www.powertechexposed.com/Centennial43-101.pdf). Powertech’s planned land application for wastewater disposal might be within their property boundaries, but the contamination might not stay there. Wind erosion from Weld County’s hurricane force winds could loft dry contaminated soil far and wide (Click here to see a map of wind directions and communities downwind from the Centennial Project). 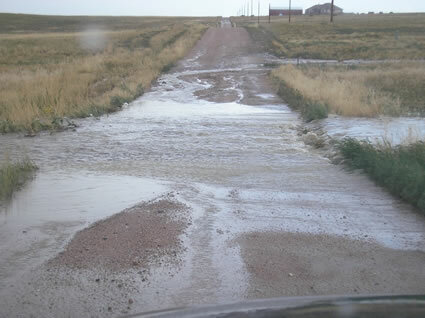 Runoff from a 2006 thunderstorm originated from the flattop mesa in Weld County where Powertech proposes to operate uranium in situ leaching. This type of runoff might flow through acreages where land application is proposed to be used for disposal of the mine’s hazardous wastes, dispersing heavy metals and radioactive material to properties and waterways down gradient from the site. June 22nd, 2009 thunderstorm dumped 4” of rain in Laporte, 3” in Fort Collins, 2 ½” in Wellington and produced tornadoes near Nunn. 17 hours after the storm, Coalbank Creek was still flooded with storm runoff coming from the area where Powertech hopes to conduct uranium mining. 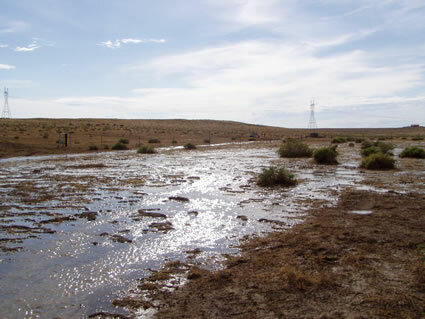 A rainstorm over land application areas might move hazardous and radioactive soils downstream into wells, boreholes, ponds, grazing areas, and waterways. Any well or borehole into an aquifer may become a point source for contamination if infiltrated by flood/runoff water. An intermittent stream across Weld CR21 in July of 2008 moving towards Nunn, Colorado. The waters originated on the flattop mesa where Powertech has proposed to operate an in situ leach mine for uranium. 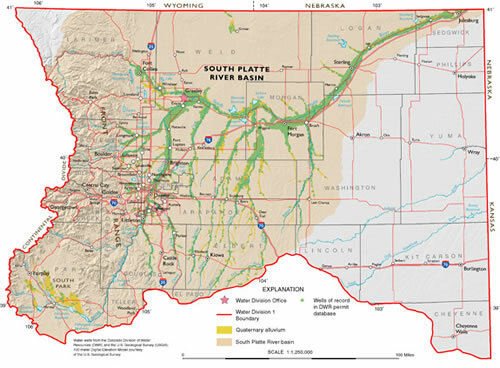 The proposed Centennial Project is within the boundaries of three groundwater resources: the South Platte River Basin’s alluvial aquifer, Denver Basin’s Laramie-Fox Hills Aquifer, and the Dakota-Cheyenne Aquifer. The Ground Water Atlas of Colorado describes the Dakota-Cheyenne aquifer as the most extensive water-yielding unit in eastern Colorado with over 27,500 wells on record as of 2003. The aquifer’s average hydraulic conductivity in the area of the proposed Centennial uranium mine is 0.03 feet per day. 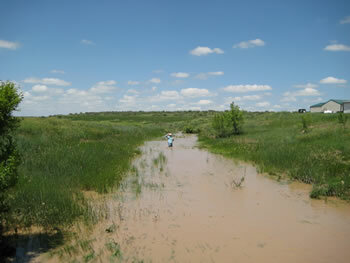 The Laramie-Fox Hills aquifer is a significant water source for commercial and municipal wells. 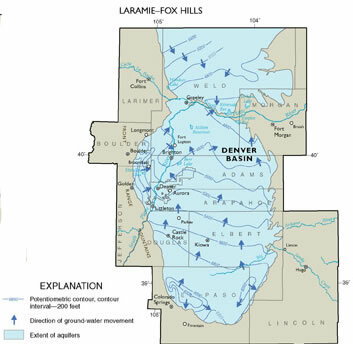 The Larimer-Fox Hills is the lowest layer of the Denver Basin where, as of February 2001, 33,700 wells had been recorded. The groundwater movement of the Laramie-Fox Hills aquifer in Weld County is toward the South Platte River. Selenium, common in the soils along the Front Range and throughout eastern Colorado, may become problematic for uranium mining in Weld County. Unnatural concentrations of selenium in Kesterson’s water resulted in an entire food chain carrying high levels of the element. Selenium caused death and deformities in all animal populations. In surface areas where selenium becomes concentrated, locoweed and other selenium loving plants can replace natural vegetation. These plants are toxic and deadly to the animals that eat them (see Selenium Contamination).